Jarauta-Bragulat, E.; Egozcue, J. J. Modelling compositional change with simplicial linear ordinary differential equations. A: International Workshop on Compositional Data Analysis. 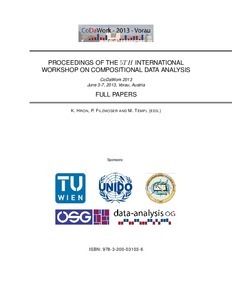 "Proceedings of the 5th International Workshop on Compositional Data Analysis". Vorau: 2013, p. 71-80.